Yesterday, I hosted a BBQ gathering at my house. Adding, that this is my second hosted BBQ! Hard to believe, since I love to cook, have my own grilling gear, and am a fan of BBQa in shalaih outings. My father always has his meat cooked barbeque style whenever he ruled the kitchen. He loved to grill anything, never used a pan, he had a very healthy lifestyle. Something, and I say that with confidence, I will never get myself into. My first hosted BBQ was last year on New Years. My friends and I had nothing interesting to do. Actually we didn't want to go out to the usual restaurants and our families weren't going to the shalaih. So we thought why not use my brand new Weber griller. I just recently got it at the time, and was so in love with how small and practical it was. Flashback (sometime last year): I got the griller from a trip in Germany, thinking this brand was amazing and so professional looking, and not cheap at all! And so I had to get it and have it shipped to Kuwait! LOL! Had to pay extra for that. Fast forward (sometime at the beginning of this year): Found the exact same griller EXACT in the Sultan Center! I could've saved and got it much earlier! Rewind (my first BBQ): And so we were all beginners, none of us knew how to grill nonetheless start the thing! With the help of my housekeeper, we had the thing going. I got fresh meat from The Sultan Center and kebabs fromthe butcher. Got a New Year BLUE cake from WOW, chocolate-pistachio flavored. The only thing good about it was that it was cute to look at having some crystals on ribbon (refer to picture below). Oh, and the best part was that the strange tasting chocolate-pistachio cake dyed our mouths and lips a striking blue! That was disgusting. We called the meal, "cancer food"! I mean the burnt residue from the grill on the meat and the food coloring blue from the cake! That was cancer in disguise! We still laugh about it to this day. Present time (yesterday): Ordered burgers, steak, and grilled chicken from Munch and the kababs from the butcher. All the food was enough to feed 6 people at the most! I told to my sister to join and bring a friend. To my dismay, she brought four. But I did love that we were more so I would be able to show off my newly "acquired" BBQ skills. Sadly, it was too late to add to the order from Munch. So I ordered shawarma from my favorite shawarma joint, Mais AlReem. For this gathering, I wanted to have a casual laid back feel both in the dress code and food. We all knew we were going to smell like burned coal throughout this. I was such a clutz yesterday, (Whats new?? ), breaking glasses and dropping meat on the floor (and thats the meat that was not enough for all!! ), and then having to give the fallen ones to the lucky stray cats. Mini Kobe burgers-comes complete with a cheese and sliced tomatoes and lettice. Sesame soya steak on skewers. Sweet chili chicken on skewers. Pizza dough with chocolate topping and diced strawberry pieces. 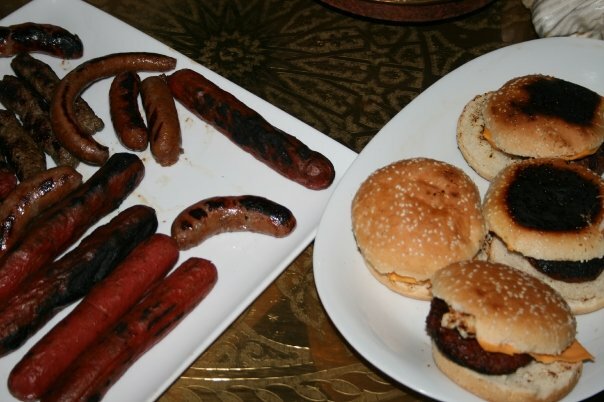 We were so worried we'd burn the food like last time, that we undercooked some of the meat! LOL! I recommend the soya steak! and the kobe burgers would've been amazing if they didn't shrink to dime-sized "meatballs"! I think we overcooked those without burning them. Next time its the regular size kobe burgers. A friend recommended them highly! 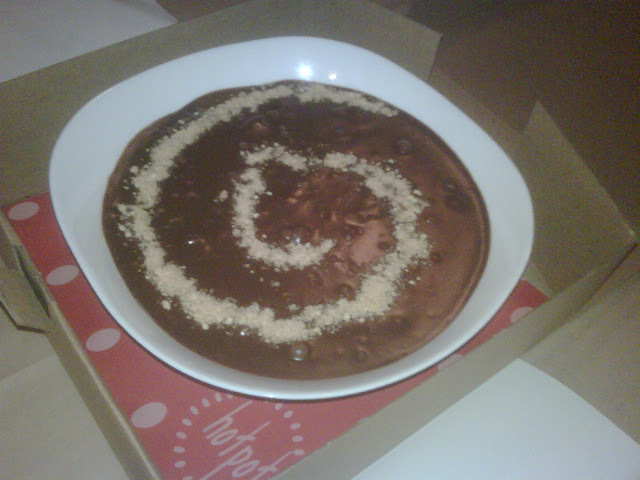 Sadly, I didn't have the chance to creat the chocolate pizza. I was so preoccupied with the gathering I didn't want to create a mess with something I had no idea how to assemble. It would've been great if they had instructions delivered along with it. So we left it aside. When it was dessert time, one of the girls grabbed the strawberries dipped them in the chocolate and ate the whole lot! LOL! And to think I was going to leave that for the next day to try to figure out when I was all alone! Eid Mubarak all! Hope everyone has an amazing holiday! 7aneen: lucky u!! so u had better luck than us! oh and WB to q8!u know what, we were actually between chocolateness and hotpot too;p insane;p i wish u had a blog and showed us what ve been up to in ur bbq!